2011 in the FL Keys has started to take shape. It has been a long road from Hudson, NY to Big Pine Key, FL, and equally as much an effort, fighting the fight through the bureaucracy of Monroe County (the Keys), but we have persevered. 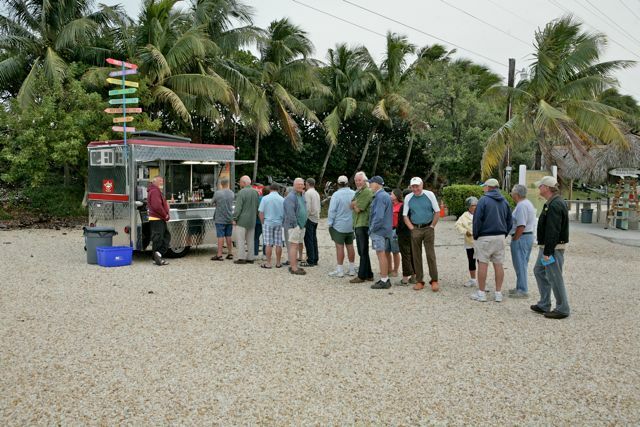 We are the only legitimate food concession in the Lower Keys outside of Key West. We have three locations and work four days. And, we have the option of blowing off two days if something better comes along. Our goal is modest. We simply hope to establish ourselves to the local community and tourists alike. And, we want to (hopefully) cover our expenses. And, so far? To our surprise, things are going very well. We have had to take a departure from our Hudson, NY practice of staying in one place, and instead move around to three different spots a week, but all considered, it's working out. We are finding our own, getting into a groove, and making it happen. That is to say that we have three days for ourselves. And, some weeks, we will even work just three days and take four days off. It's the perfect balance, and "balance" is a key ingredient to our purpose; of why we are here. We want to enjoy life and live in the present. We want to experience the Keys in all of its beauty. We want to succeed both in business and play. We want to cover our expenses. And, we also want to enjoy our boat, go swimming, make it down to Key West, have time with our dogs, get healthy, decorate our modest home, and just enjoy life. Otherwise, we've messed up our mission. The word on the street is good. We are a "go to" place. But, it still takes a while before Keys folks get to you. So, the RV parks that we cater to make up for the slack. In fact, if we had our druthers, we would gladly become the full time restaurant for the Big Pine Key Fishing Lodge. Or, at least two days a week. It's such a nice environment, and almost an island unto itself. For now, we will gladly take Thursdays and hope to earn more days as time passes. So, for a first year, we are happy. We see two sides of a coin, and we see that our efforts have not been wasted. So, for January through April, we are here, doing this. And, come May, we will look forward to a great Summer in Hudson, NY. Really great! So, people of Hudson, get ready. We certainly will be.